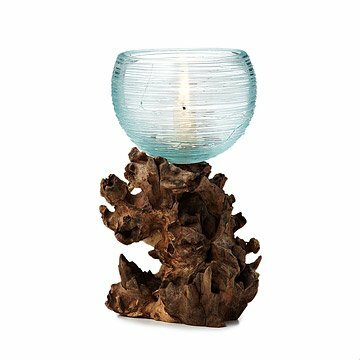 Create a striking silhouette with this gamal wood and blown glass votive candleholder. Bridging the gap between organic and manmade, this intricate votive candleholder cuts a striking silhouette. Handmade from the roots of an Indonesian gamal tree, the gnarled bark base creates a daring contrast to the hand blown glass vessel draped on top. Naturally occurring material ensures a unique piece every time, ideal for holding candles, cut flowers, or decorative stones. Handmade in Indonesia. Approx. : 8.5" H x 5" dia. Beautiful wood and glass bowl melded together. Returning. Process seems convoluted. Too rustic for my home, may do well elsewhere. I purchased this for my gay brother in law who LOVES fancy unique gifts. I love him dearly and really wanted to find something special. This was really not it. It's a cool idea and looked nice in the box but when you stand it on a table, it's totally crooked. It makes it look cheap and yet the price isn't that cheap. I was disappointed but gave it to him anyway because I had nothing else and it arrived so close to Christmas. He liked it but doubt it will ever make an appearance when he has company over. Overall i enjoyed the product but it was VERY small for the amount of money it cost. Got this for my mom and she loves it. Very attractive. I LOVED this product -however- the description said it was BLUE, which is exactly what I needed/wanted. When it arrived, I found it was GREEN (more teal)!! I could NOT use a green-tone piece and had to return it. I was so disappointed, as it is just what I wanted, had the color been as represented!!! My glass top is too big for my tree root base, and it is extremely fragile. I took it out of the packaging a piece broke off of the base. It really does look nice.